Had a great visit with our daughter, Jordan, in Nashville. We don't do much sightseeing there--seldom worth the traffic--so we figured we needed at least a shot of a sign that actually said "Nashville." 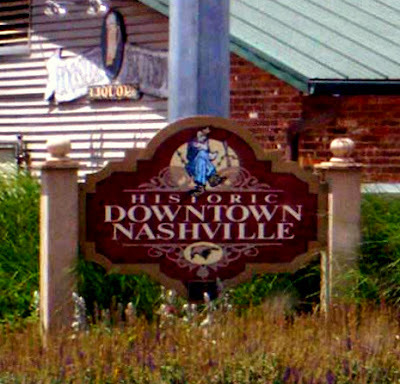 Unfortunately, we didn't think of that until a little later; so this is a sign in Nashville, Indiana. Cool sign, though, don't you think? And those aren't weeds. They're wildflowers. Seriously, we did commit a perfectly touristy act by touring the famous Opryland Hotel "Lobby," actually a waterway garden that winds through the whole facility. ...and a view enhanced by a figure in the foreground. It's all indoors, of course; but the fish, birds, ducks, and geese didn't mind. Then we bid a cheese fondue to the South and headed for port in Michigan once more for a long winter's work, Judy as Girl's Dean for the same Christian Boarding School, and Whitt bracing for a steep learning curve as he jettisons the ancient technologies he learned back when dinosaurs roamed the earth and attempts to embrace--yea, even begin to grasp--the most modern tools of our humble trade. Watch this space (and our other pages!) to see how he does. On a good news note, a couple of new gospel songs have come down, and we've cranked out a good deal of new comedy songs and material. Have to admit, life ashore has its points; like leaving the studio set up and the files out where they can be worked. A kitchen and washer and dryer and shower help, too! Hope to see you around the site.